From May 15, 2017, through June 18, 2017, customers can get $20 off select DEWALT purchases of $100 or more from ACME Tools. Use coupon code 20-DEWALT during checkout. The deal says it is limited to select DeWalt products, but the selection is usually pretty large and includes both DeWalt tools and accessories. 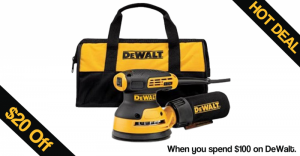 You can mix and match DeWalt products to reach the $100 minimum. Also be aware that there are other current DeWalt deals on ACME Tools, so you may be able to combine offers to get an even better deal.